Little, Brown Spark, 9780316322928, 416pp. As the Paleo movement sweeps the nation, millions have discovered the health benefits of following the lifestyle of our hunter-gatherer forebears. But what happens when we hit a wall and weight loss stalls, energy flags, illness sets in, or we're tired of restricted eating? 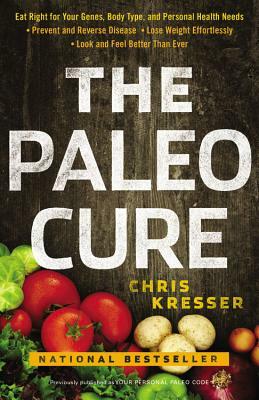 In The Paleo Cure, Chris Kresser uses the Paleo diet as a template from which you can tailor a simple yet powerful three-step program-Reset, Rebuild, Revive-to fit your lifestyle, body type, and genetic blueprint. You'll learn how to eliminate the toxic foods that cause illness and weight gain, how to sleep better, exercise like our ancestors, cultivate pleasure, and vastly improve overall health. Kresser helps further personalize your prescription by addressing specific health conditions, from heart disease to digestive problems. Best of all, you only have to follow the program 80 percent of the time; there's room to indulge, in moderation, and still experience dramatic results. Comprehensive, dynamic, and enlightening, The Paleo Cure is based on cutting-edge research and combines the best of ancient wisdom and modern science. It provides a flexible and accessible program with helpful charts and quizzes, a seven-day meal plan, and delectable, nutritious recipes to help you lose weight, reverse disease, and achieve optimum health. Chris Kresser, M.S., L.AC., is a practitioner of integrative and functional medicine and the creator of ChrisKresser.com, one of the most respected national health sites in the world. He maintains a private practice in Berkeley, California, where he lives with his wife and daughter.